Hello ... Hello ... my old friends ... It's great to see you once again! It was great to touch base with Phil Bates and Mark Stanway at the recent Wheels Of Fire gig early last month here in sunny Wolverhampton. At that concert, Mark [pictured opposite, far right] agreed to an interview with Yours Truly KJS for ELO Beatles Forever [ELOBF] in advance of the forthcoming new Magnum release "The Visitation" and the ensuing tour. It really is a blessing to be able to converse with and interact with those musicians in the ELO [and related artistes] universe who inspire us so much. KJS: You joined Magnum in 1982 and your first Magnum album was their classic LP "Chase The Dragon". How did your membership of Magnum come about? MS: I actually joined Magnum in 1980 and my first recording with Magnum was on a live version of "Changes". My joining Magnum came about during Magnum’s 1979 tour with Def Leppard. Tony had asked MCP and Monsters Of Rock tour promoter Maurice Jones if he knew of a keyboard player to replace their present keyboardist Grenville Harding who was apparently not an ideal long term member. Maurice Jones was a very good friend of mine and at the Derby Assembly Rooms during 1979, I accompanied Maurice to the gig and Tony and Bob asked me to join there and then! We obviously knew each other from before that point as we were in rival bands [me in Birmingham's Rainmaker] both playing regularly at the famous Railway Inn in Birmingham. KJS: Magnum were label mates of ELO on Jet Records until its demise. Do you recall any interaction between the bands and do you have any memories of the late Don Arden? MS: I have many memories of being stable-mates on Jet Records with ELO and especially memories of Don Arden. I remember me and Tony Clarkin arranging an appointment to meet Don on the hopes of having our ‘retainer’ increased and I will always remember what Don’s first question was to us that day…he said: “How many of there are you in the band?" Well, we had only recorded three albums with Jet and I wish I'd have said there were 16 of us in the band!!! KJS: Tony Clarkin has penned some great songs. Which ones stand out for you personally? MS: With a catalogue of over 200 songs he is a true song smith and that makes it difficult to pick one out but I would have to say that some of my favourite songs by Tony and Magnum are "Tall Ships", "On A Storytellers Night", "Last Dance" and "Sacred Hour" to name a few. 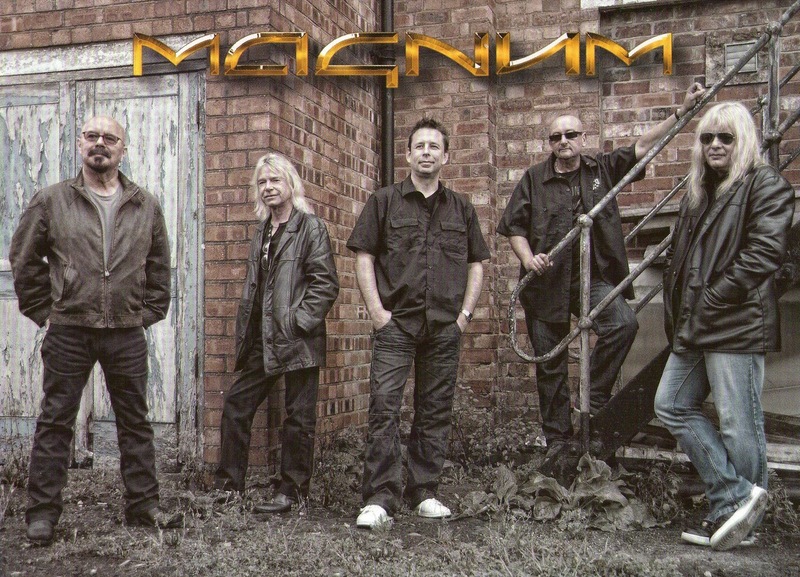 KJS: Magnum have matured into a great British rock band with the reputation of being the loudest. All your albums have charted and you experienced significant singles success in the late eighties and nineties. What are your personal high spots with the band? MS: Loudest? Powerful might be a better way of putting that I think! Highs? There are many but I guess selling out the NEC and Wembley figure well in my memory. KJS: Magnum and Trickster were also Jet Records label mates. How did your involvement with Phil Bates and Wheels Of Fire come about? MS: I actually met Phil in more recent years because of a Mississippi Blues singer called Lisa Mills whom both I and Phil have worked with. She was doing a Blues gig in Wales and Phil was on the same bill performing solo. I caught his show and was so impressed by his playing and his wonderful voice that we became friends and have stayed in touch ever since. Phil is a most accomplished and special musician. KJS:What are the plans for Wheels Of Fire for 2011 and beyond? MS: Our plans are to play together as often as we can, as it is so refreshing to play with such good musicians as Clive Bunker and Brian Badhams [whom I was in Rainmaker with for 3 years during the 70’s]. Our only problem is each individuals availability all at the same time! KJS: It's ironic that were Magnum not only label mates with ELO at Jet but your latest album "The Visitation" - available from Monday 17th January - is released on SPV Records, with whom the last ELO Part II live album "One Night - Live In Australia" was released in 1996. What can you tell us about the new album and its influences? MS: Yes it is all a little ironic. With regard to influences, one must remember that we have been together [or at least three of us for over 30 years] so our influences are mostly a tried and tested format with each other with a little individualism thrown in. My influences are so varied from big band swing, Art Tatum, Fats Waller, The Beatles to Jeff Beck & Stevie Wonder to name just a few! KJS: Magnum are touring again in 2011. Where [and for how long] are you touring in the UK and beyond? KJS: What is Mark Stanway planning alongside his Magnum and Wheels Of Fire activities? You have played with some other well known acts haven't you? MS: Yes I have been very lucky to have played with many great musicians over the years including Phil Lynott [Grand Slam] and Robert Plant. Outside of Magnum and Wheels Of Fire, not forgetting that I have also played with Carl Wayne with Magnum and as The Move at Hammersmith Odeon. KJS: Finally, your absolute fave Jeff Lynne composition[s] &/or ELO song[s] is/are? MS: So many to mention but I did think that "Discovery" and "Out of the Blue" were great albums and not forgetting the wonderful Traveling Wilburys - if that is how you spell it! Once again, my humble gratitude and thanx are extended to Mark for his time and participation in this interview. Mark Stanway will be touring with Magnum during Spring 2011 and promoting their new album. We might even be fortunate enough to see and hear Wheels Of Fire again at some point too later this year. ELO Beatles Forever [ELOBF] recommend both Wheels Of Fire and Magnum to those enlightened folks who enjoy the music of ELO, Jeff Lynne, Roy Wood, The Move, The Idle Race, 'Brum Beat', The Beatles and related artistes. Superb insight with Mark, in particular "Lisa Mills", small world!!! Love that Korg!! !